Diagnosis is made based on physical exam findings with confirmation by axial CT. The patient is taken for radiography of the head and neck then after obvious fracture signs the patient is taken to CT scan for more specific anatomic information. To qualify for LeFort Fractures the pterygoid plates must be involved. These are seen posterior to the maxillary sinuses on axial CT and inferior to the orbital rim on coronal slices. Also, the palate is usually mobile on physical exam. zygomaticomaxillary junction, and traverses the pterygomaxillary junction to interrupt the pterygoid plates. Le Fort II fractures (pyramidal) may result from a blow to the lower or mid maxilla and usually involve the inferior orbital rim. 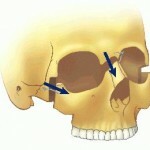 Such a fracture has a pyramidal shape and extends from the nasal bridge at or below the nasofrontal suture through the frontal processes of the maxilla, inferolaterally through the lacrimal bones and inferior orbital floor and rim through or near the inferior orbital foramen, and inferiorly through the anterior wall of the maxillary sinus; it then travels under the zygoma, across the pterygomaxillary fissure, and through the pterygoid plates. ethmoid, through the vomer, and through the interface of the pterygoid plates to the base of the sphenoid. This type of fracture predisposes the patient to CSF rhinorrhea more commonly than the other types. In reality, the Le Fort classification is an oversimplification of maxillary fractures. The amount of force impacted during a motor vehicle accident is much greater than Le Fort took into consideration during his work in the late 19th century. In most instances, maxillary fractures are a combination of the various Le Fort types. Fracture lines often diverge from the described pathways and may result in mixed-type fractures, unilateral fractures, or other atypical fractures. 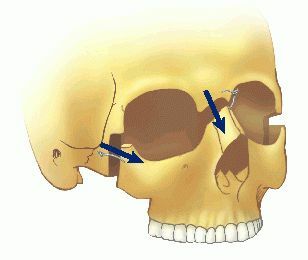 In addition, in very high-energy blows, maxillary fractures may be associated with fractures to the mandible, cranium, or both (ie, panfacial). Two types of non–Le Fort maxillary fractures of note are relatively common. First, limited and very focused blunt trauma may result in small, isolated fracture segments. Often, a hammer or other instrument is the causative weapon. In particular, the alveolar ridge, maxillary sinus anterior wall, and nasomaxillary junction, by virtue of their accessibility, are common sites of such injury. 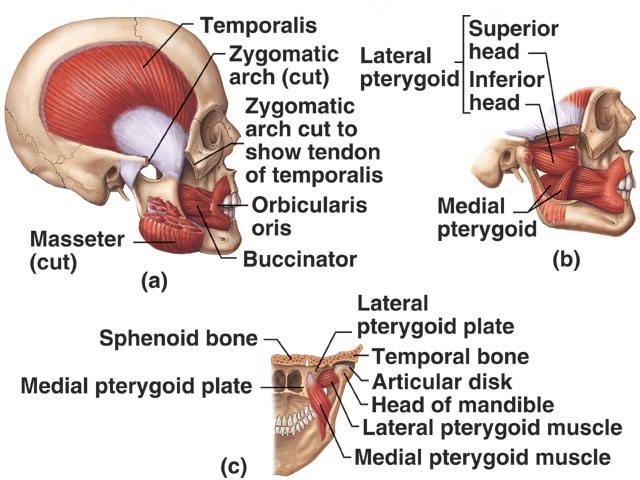 Second, submental forces directed superiorly may result in several discrete vertical fractures through various horizontal bony supports such as the alveolar ridge, infraorbital rim, and zygomatic arches. deformity. Instead, the basis for the patterns of maxillary fractures depends on 2 predominant factors. absorbs the energy of traumatic force. This serves to protect the more vital intracranial contents from damage during trauma. Knowledge of the characteristics of the traumatic blow combined with an understanding of the anatomic bolstering in the face can help the clinician approach such injury in a logical and systematic fashion. Lefort I – Slight swelling of the upper lip, ecchymosis is present in the buccal sulcus beneath each zygomatic arch, malocclusion, mobility of teeth. Impacted type of fractures may be almost immobile and it is only by grasping the maxillary teeth and applying little firm pressure that a characteristic grate can be felt which is diagnostic of the fracture. Percussion of upper teeth results in cracked pot sound. Guerin’s sign is present characterised by ecchymosis in the region of greater palatine vessels. ecchymosis, bilateral subconjunctival haemorrhage, epistaxis, CSF rhinorrhoea, dish face deformity, diplopia, enophthalmos, cracked pot sound. Lefort II – step deformity at infraorbital margin, mobile mid face, anesthesia or paresthesia of cheek. Lefort III – tenderness and separation at frontozygomatic suture, lengthening of face, depression of occular levels, enophthalmos, hooding of eyes, tilting of occlusal plane with gagging on one side. 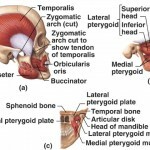 This entry was posted in Oral Surgery on January 15, 2012 by chzechze.